Welcome to QA Creations! I’m Heather, and this is my little corner for sanity sewing. I started with quilting back in 2010, but when I was pregnant with my daughter I sewed my first dress. With complete ignorance of the fact that garment sewing is supposed to be difficult, I just followed the directions and made some garments that I am still proud of today (even with a little more experience). 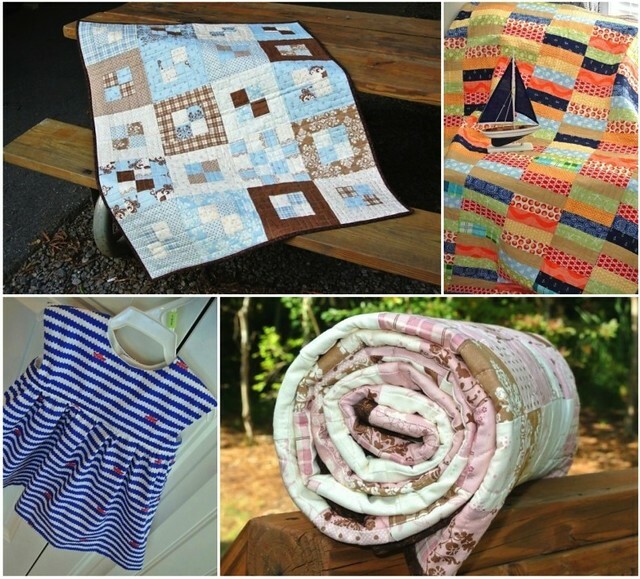 Now I still make quilts, but sew for my daughter and even myself (still learning on the women’s clothing front!). – I adore chocolate, but don’t like doughnuts. – I now love to sew and cook, but pretty much refused to do either before almost age 25. I ate a lot of boxed macaroni and cheese and lean pockets. – I was chastised by a tailor when I was in college because I took a shirt there to get a button sewn on. Now, I sew clothing for myself and my daughter though I still rarely do buttons. I used to blog as Bobbins and Bullets, but switched to QA Creations because it represents who I am now as opposed to what my job used to be. The post announcing the name change explains it a little more. 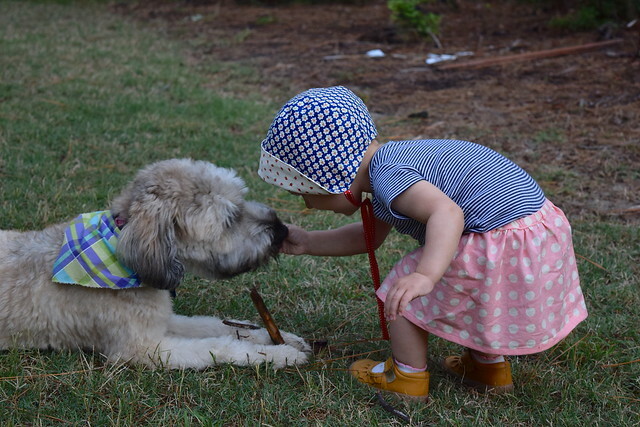 Now, I am momma to a 16 month old little girl that loves doggies and her family (and yes, probably in that order!). The name QA Creations is a combination of Quilts Actually, my long arm business and the stuff I create and document here. Blogging Tip: Don’t choose a name that scares people! No seriously, it’s better to choose something that has some room for you to grow and develop without boxing you into a corner or making people think you are some type of nut. Quilting Tip: Label your solids and interfacing. I learned this lesson the hard way because none of mine are labeled and when I go back to look at a fabric I bought years ago I don’t even remember what brand it was, much less which exact shade of the 30 possible greens there are that it is. And just which white is it? Why are there so many whites?!? It’s been a little busy so far this summer, but I have managed to get some summer sewing in. June was Made for Kid’s Month, after all. 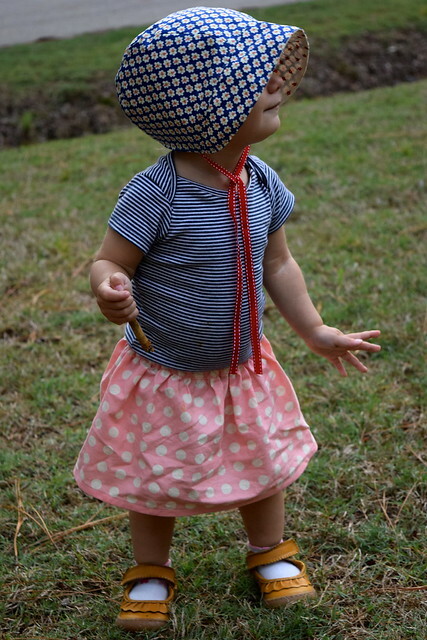 I love a little girl in bonnets, and hers was getting a little small. 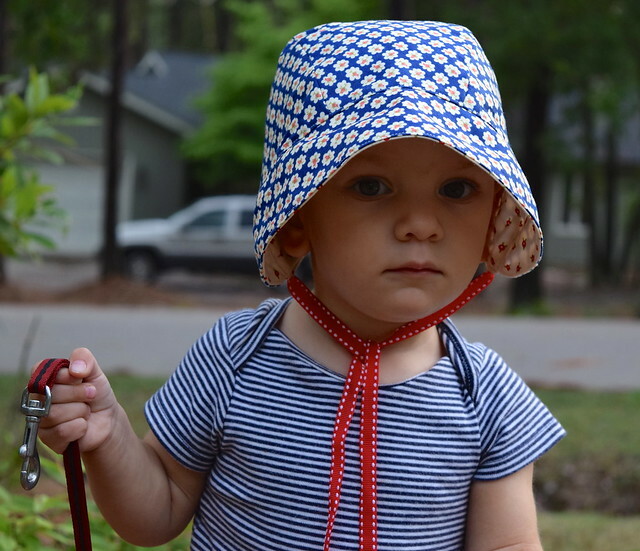 I made the 7th and 8th versions of the Little Betty Bonnet pattern. It comes in only three sizes, but I play with the seam allowances to get a better fit. 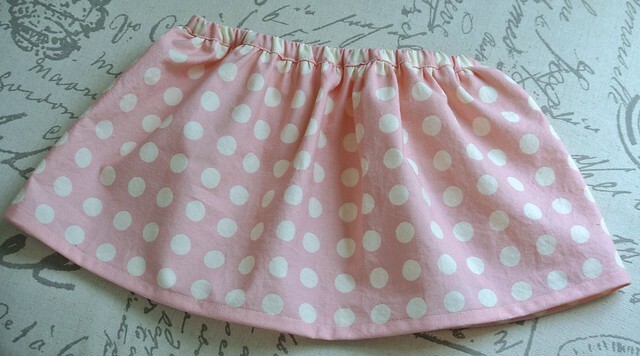 The one that is getting small was the straight 18-24 month size, with a 3/8 inch seam as the pattern calls for. It fit her head fine, but the bill wasn’t covering her face. The one I made last fall with the 1/4 inch seam throughout is still too big. Therefore, I used the 3/8 inch seam on the top of the bonnet, and the 1/4 inch seam in the back and on the bill. That gave the extra length to cover her face, but didn’t make the whole bonnet so huge that it would be unwearable. 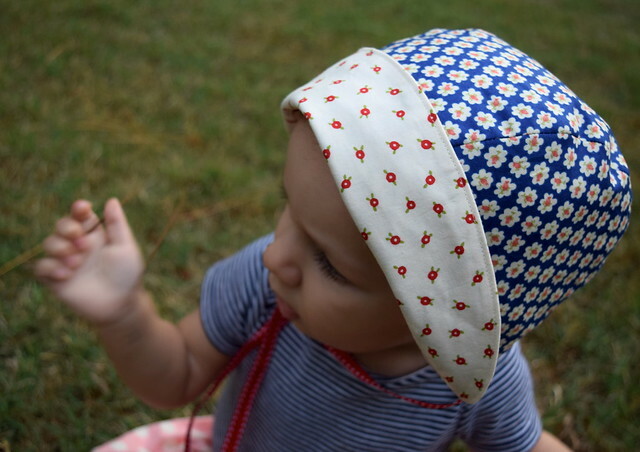 You can also push the brim back and show off the coordinating fabric because the whole bonnet is reversible. 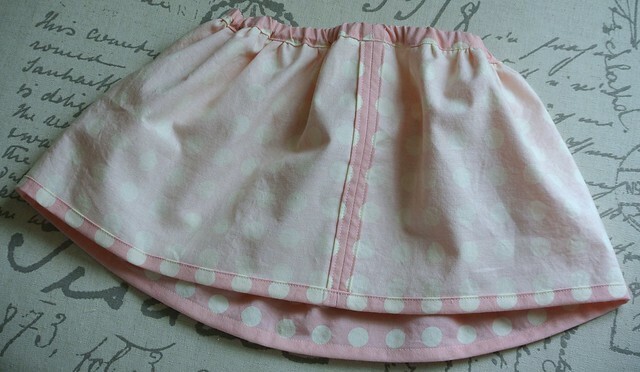 I also made a little skirt for her, no pattern. I used the measurements off a skirt she already has, but some time lapsed between taking the measurements and making the skirt, so I forgot to add seam allowances. It would have been a little short, but I added a separate waist which saved the skirt. 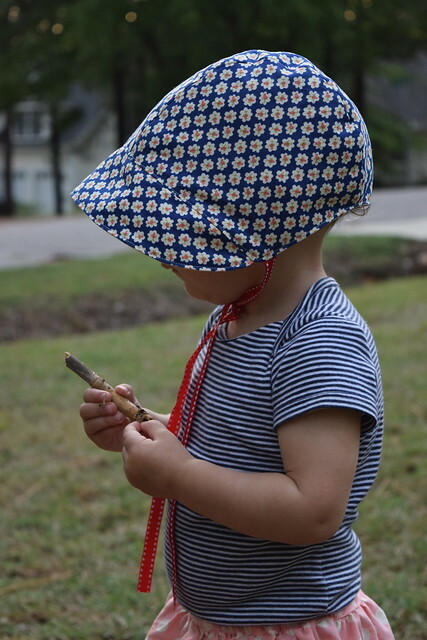 I love her in a skirt, and it’s a great use for leftover fabric. 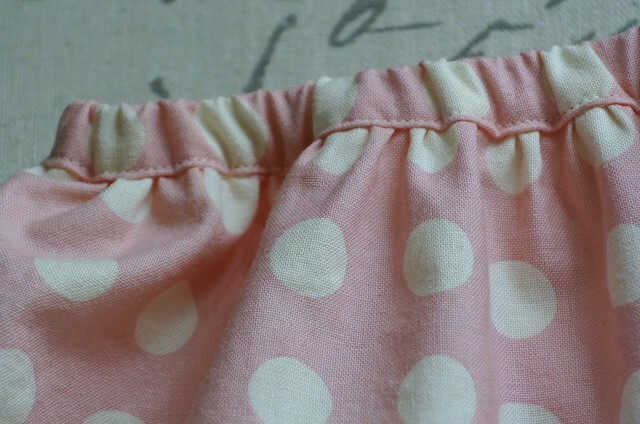 I also love clean inside seams!